No end in sight for wildfire haze in parts of B.C. It will likely be at least several days before some parts of British Columbia see a return to normal summer skies. Environment Canada has issued air quality advisories for most of the province due to the ongoing haze created by fine particulate matter from the hundreds of wildfires burning across the province. The particulate matter isn’t good to inhale. The B.C. Air Quality Health Index reports that there were “moderate” to “very high” health risks throughout the province on Monday. On Tuesday, Victoria, Nanaimo and Metro Vancouver are expected to face a “high” risk from the poor air quality. The particulate matter was expected to hang in the air around Vancouver and Victoria for most of the week, although that forecast could be affected by changes in wildfire behaviour or atmospheric conditions. 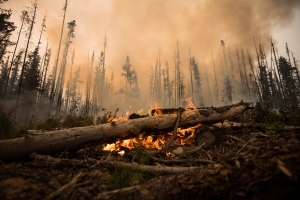 “The smoke from the fires up north is blowing down to the south and being held along the coast between the island and the mainland,” Sarah Henderson, a senior environmental health scientist with the BC Centre for Disease Control, told CTV News Channel on Monday. Henderson said testing had shown levels of fine particulate matter of up to 200 parts per million in some B.C. communities. Normal levels are below 10 parts per million. Photos posted online showed the sun nearly obscured by haze even at midday, creating a feeling of permanent dusk during daylight hours. The poor air quality has also been affecting air travel in the province’s interior. At least 16 flights at Kelowna International Airport were cancelled or delayed on Sunday, while cancellations were also reported at airports in Penticton and Castlegar. Outside the province, air quality was expected to improve across much of the Prairies, as shifting winds directions pushed some of the ash south into the United States. 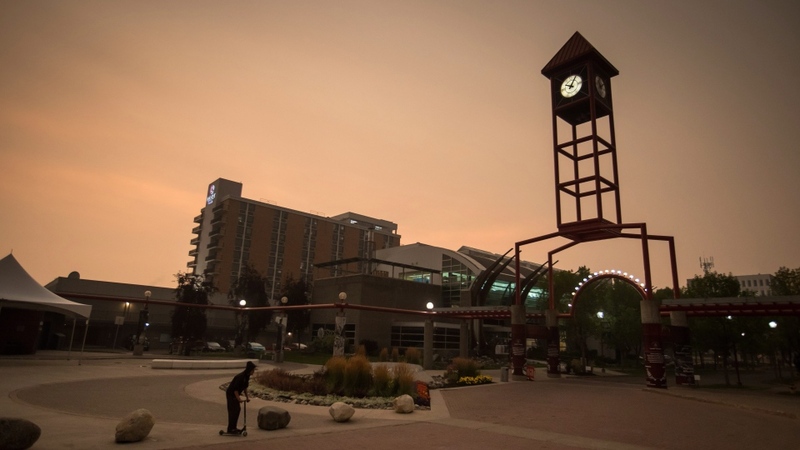 The Breezometer, an online map tracking air quality levels on a scale from 0 (worst) to 100 (best), reported Kelowna’s air quality at a 20 level and Calgary’s at a 31 as of Monday morning. For comparison, Beijing and Mumbai – two cities renowned for typically poor air quality – scored 47 and 50 respectively. Some portions of the B.C. interior scored as low as 0 on the Breezometer Monday morning. 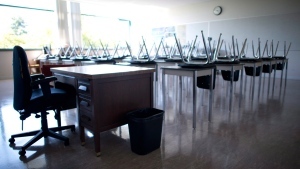 Environment Canada warned that some of the particulate matter is small enough to “easily penetrate indoors” and said infants and seniors were among the people most likely to feel respiratory symptoms. People with chronic underlying medical conditions were being advised to avoid strenuous exercise until the air quality improved. While some people have started wearing surgical masks outdoors to protect their respiratory systems, Henderson cautioned that her organization does not recommend fighting the effects of the fine particulate matter with masks, except for people who have to work outdoors. “A mask is only going to clear smoke for you if it’s fitted correctly. If it’s not fitted correctly, all it does is make it harder to breathe,” she said. Instead, Henderson said, people in areas with smoky, hazy skies should try to limit the amount of time they spend outdoors as much as possible. As B.C. residents look for ways to cope with the poor air quality, firefighting crews are reporting progress as they continue to battle hundreds of wildfires. “From one corner of the province to the other, we’ve got major fires of note burning right now,” Kevin Skrepnek of the BC Wildfire Service told CTV Vancouver. A province-wide state of emergency has been in effect since Aug. 15. Approximately 6,000 people living near active fires have been told to leave their homes, while more than 11,000 people have been warned that evacuations could be ordered. About 2,200 evacuees have ended up in Prince George, where some people said they were sleeping in their vehicles until other shelter could be found. The Shovel Lake fire is considered to be one of the highest priorities for firefighters. A planned burn was carried out on the fire’s southern edge on Sunday, which officials said would help ensure that the flames would not spread any farther in that direction. The fire was discovered July 27 and has since grown to nearly 85,000 hectares, or slightly larger than the City of Calgary. Forrest Tower, an information officer with the BC Wildfire Service, told CTV News Channel Monday that 229 firefighters and 47 pieces of heavy equipment had been dedicated to the Shovel Lake fire. Eight helicopters were also being shared between Shovel Lake and a nearby fire, although reduced visibility due to smoke was making it difficult for officials to detect new fires and for crews to fight existing wildfires from the air. “It is difficult when we aren’t able to use helicopters and air tankers, etc,” Tower said, adding that the smoke cover also helps firefighters by increasing humidity in the air and lowering temperatures on the ground, both of which slow fires’ ability to spread. Tower said long-range forecasts suggested winds could lighten in the Shovel Lake area, with rain potentially moving in by the weekend – both of which would be welcome news for firefighters. Another notable fire, the 633-hectare Gottfriedsen Mountain fire, was brought under control on Sunday. Six new wildfires were discovered in the province the same day, bringing the total number burning to 433 by the end of the day. Authorities believe five of the six were sparked by lightning and the sixth by human activity. Overall, hundreds of thousands of hectares of land across B.C. have been scorched by this year’s 1,891 known wildfires – more than the province has seen in any full year since 2009. The map below shows B.C. wildfire locations. Using our app? Touch here.